Despite well-funded opposition, New York’s mayor was able to deliver on the biggest commitment of last year’s campaign. 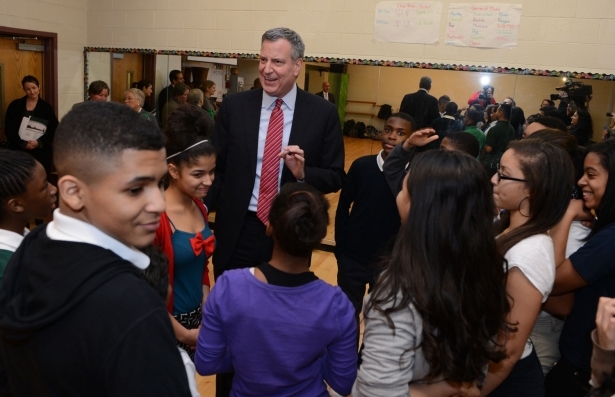 With Albany’s passage of the state’s 2014–15 budget, New York City Mayor Bill de Blasio will see his plans for universal pre-K education and an expansion of after-school middle school implemented in the five boroughs. But with significant concessions made for the accommodation of charter schools, as well as a rejection of the mayor’s preferred source of funding for the programs, the victory is qualified, and the outlook for pushing more progressive reforms in the state seems murky. It shouldn’t be. Educational inequality in New York City runs rampant. My Nation colleague Betsy Reed has written here: “There are currently only 20,000 full-day [pre-K] spots for 68,000 eligible children. Everyone else has to either cobble together informal care or pony up for daycare, which costs an average of $13,000 per year—a sum barely manageable for most two-income households, let alone single parents. In affluent neighborhoods, the annual bill runs anywhere from $20,000 to $40,000 per child, a burden even for some families making more than $100,000 a year.” Given the near-universally acknowledged benefits of pre-K education, we should be, like Mayor de Blasio, deeply invested in providing it to NYC families. It’s time to work on behalf of all New Yorkers, and we need more campaigns (and more successes) like UPKNYC to remind us that a great city needs to serve all its people, not just the few. Still, while successful, the fight over UPK is a cautionary tale, and as the New Yorker’s John Cassidy points out, the deck is stacked against anyone who wants to make similar progressive reforms in the city. “If you want to get anything done,” he writes in an analysis of the pre-K battle, “you have to look responsible, reassure independents that you’re no dangerous radical, and cozy up to business and financial interests.” When de Blasio decided not to follow the script, he got smacked down: The mayor’s original plan of funding his pre-K and after-school programs via a temporary Personal Income Tax on the city’s top 1.4 percent of wage-earners was rejected, a victim of well-funded rage (and of future fundraising concerns for Gov. Cuomo’s reelection campaign this fall). Furthermore, allowances made to charter schools, including a mandate that requires the city to find and allocate space for charter schools on existing public-school turf, might end up further weakening New York’s public schools. And don't think it won't be a turf war. Diane Ravitch writes, “While it is true that [charter schools] enroll only 3 percent of New York state's children and only 6 percent of New York City's children, their boards contain the city's financial elite. They can pay millions for a media campaign; they can make $800,000 in campaign contributions to Governor Cuomo….” There’s that well-funded rage. Nevertheless, at end of the day, despite the concessions made to charter schools (which are legion and problematic), the less-than-optimal source of funding, and the chilling notice given to anyone who might deign to ask the one-percent to pay full freight, New York’s new program still represents a strong expansion of the education system. Essentially, a new grade of school has been carved out in New York City, one that will eventually reduce the segment of the population that will in the long run be poor and boost college graduation rates for children. Ultimately, the city should win with this one. And beyond education, universal pre-K is encouraging as a sign that Mayor de Blasio can deliver on his biggest commitment of last year’s campaign. Albany will deliver real money for a real program. In de Blasio, New York has a mayor who’s willing to lead from the left, even in the face of mounting, and moneyed, opposition. He has installed as parks commissioner someone whose goal is “a more equitable approach to our parks,” and he has repudiated some of Bloomberg’s more aggressive policing tactics. There’s an opportunity here to deliver the city back to its perch at the forefront of progressive and social reform in America. Let’s not waste it.